Click below to view our latest press releases! Since I became part of the One Two Tree family back in 2001, I learned to give back to our community by participating in many of the events that we sponsor or are part of every year. A few months ago, I was talking to my daughter Anita about getting involved with a nonprofit organization to give some of my time to a good cause. She is a member of the FBA, or Forever Bloom Alliance, which is an organization led by students, teachers, volunteers and business professionals. Their personal mission is to promote the educational and social well-being of America’s youth. She invited me to participate and I liked the idea of giving back to our community by helping young people participating in different events. 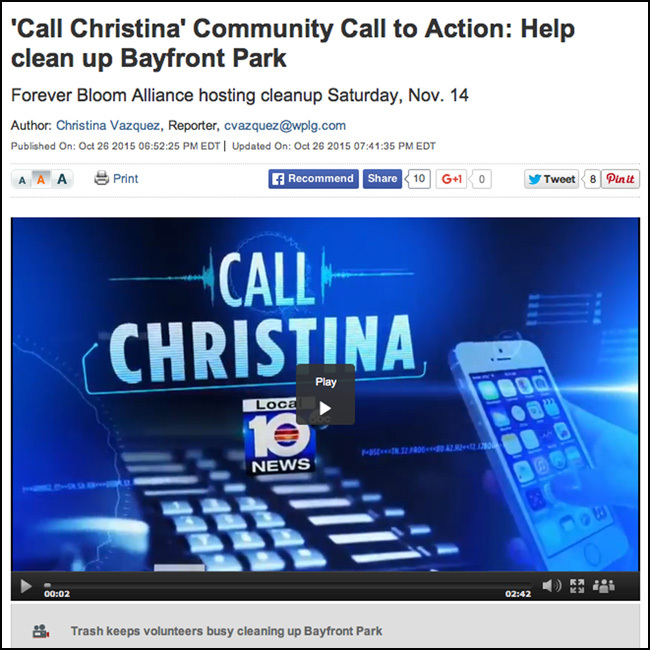 One of their events is the shoreline clean up at Bayfront Park, which is monthly volunteer work to clean up the beautiful Biscayne Bay shoreline. This area connecting Bayside and the Miami River is important to the upkeep of the beauty of our city, and is now one of the community events sponsored by One Two Tree. I feel that this is a good way to give back, by supporting America’s youth and also spending quality time with my daughter. Communities, like flowers, need attention if they are going to bloom. The Forever Bloom Alumni Association, which had its first meeting in fall of 2006, has blossomed into an organization known for its educational public charity led by not only community students and teachers, but also parents and local volunteers. FBAA’s purpose is to promote both academic and social development of the community’s youth through various community service projects, mentoring, networking, achievement recognition support and even educational travel. The Name “Forever Bloom” comes from Bloom’s taxonomy of learning domains as suggested by the organization’s founder, Anthony Reid. The name essentially means that the organization will forever grow and aspire. In addition, despite the second part of the name “Alumni Association,” FBAA is for everyone and anyone who wants to participate. In the six years of FBAA’s existence, the Board of Directors and a few volunteers managed to create a wealth of programs to reach out to their community. Among these programs is the Forever Mentoring Program. This program arranges mentoring partnerships between middle and high school students while college students are paired up with post-graduates and even professionals. The organization houses approximately 200 full and junior members and works with other establishments, including “Stand Up For Love,” a group of dancers who perform in FBAA events to advocate positivity and social awareness in youth. “Back to School Night,” which happens every year during the first week of school, consists of going to a local Fuddruckers for the purpose of donating school supplies to a local organization in need. “Joining the group has helped me not only be more involved in the community but it has also opened my mind to ‘the bigger picture,’” added Duverge. 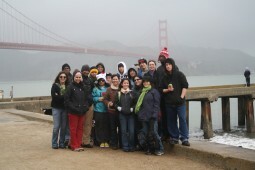 In addition, the FBAA ADVENTravel Program, established in 2009, organizes community service-based trips for youth, such as a trip that took place during Spring 2010 to San Francisco. “Through FBAA, members are able to experience things outside of their normal routine and they do it with guidance from their mentors. The trip to Canada, for example, allowed students to go somewhere they normally would not, and to do it safely and enjoyably,” said Vanessa Grijalba, a senior and health service administration major. The second trip took place June 14th of this year. Their destination was Montreal, Canada where a total of 27 participants became acquainted with Montreal’s museums, city festivals and a community service event held at the University of Montreal. This time around, study groups were created in order to maximize the learning experience, giving participants various assignments relevant to their trips. The assignment included a 40-minute presentation on a topic related to Montréal. A nonprofit group gives students a chance to connect with mentors, perform community service, and travel to distant locales. On his first visit to San Francisco, Braddock Senior High sophomore Mario Guzman did more than just snap pictures of landmarks. Mario, 16, joined members of the nonprofit Forever Bloom Alumni Association to package rice at the San Francisco Food Bank. The organization is dedicated to mentoring and educating middle- and high-school students. “I finished the community work that we did in San Francisco really feeling and knowing that we all made a difference in other people’s lives,” said Mario, who documented the March spring break trip on camera. The spring break trip was part of Forever Bloom’s ADVENTravel program, which provides members affordable group visits across the U.S. and abroad while doing community service. Adult members served as tour guides and mentors. In all, the 21 members packaged 30,000 pounds of rice in San Francisco. Mario said the trip not only taught him to be a good Samaritan, but credits FBAA members for teaching him other important lessons. “They taught us about responsibility,” said Mario, who joined the group five months ago and hopes to one day make a movie with the footage he shot. Paul W. Bell Middle School teacher Anthony Reid founded the not-for-profit in 2007 to help former students keep in contact. Reid said his former students are inspiring. 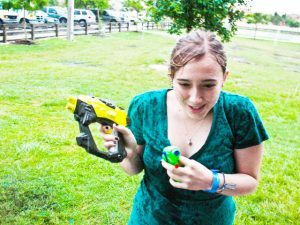 “They made me realize what valuable assets they are for helping to mold other young people who would not normally have the benefit of being around successful students,” Reid wrote in an e-mail. In South Florida, FBAA members have painted murals and boardwalks for the non-profit Hands on Miami, and taken part in beach clean-ups. At first, the organization was only intended for Bell alumni. But Forever Bloom is now open to anyone. Named after Bloom’s Taxonomy — an educational method created by educational psychologist Benjamin Bloom — the organization has 253 members. Interim Vice President Jerica Duverge, 22, said she relished her role. “It would have been nice to have alumni mentor me while I was in secondary school,” said Duverge, 22, who recently graduated from Florida International University with a degree in nursing. For information, go to www.foreverbloom.org. 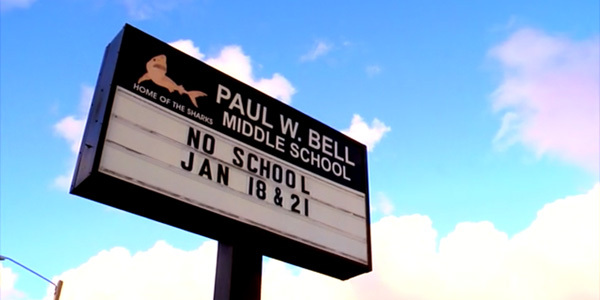 FBA showcases some of Paul W. Bell Middle School’s most successful alumni through a mini-video montage speaking on why it is one of the best middle schools in Miami-Dade. Join our team of successful MDCPS alumni and support FBA youth! Featuring: Fryda Guedes, Claudia Brea, Esq., Manuel Garrido, Ethelence Aburto, Stephanie Guerra, and Elise Rodriguez, Esq. On November 16th WVUM 90.5 FM invited FBA directors Anthony Reid, Stephanie Guerra, and Jeremie McLeod sit down for an interview on the station’s ‘Not for Profit’ show hosted by Shelly Lynn. Click on the image to listen to the interview.